​Join us for a public talk featuring Igor Serebryany, columnist, editor, a former Producer of BBC World Service and a former member of the Moscow Provincial Parliament, who founded an organization similar to ours in Russia called the All Russia Fathers’ Committee. Full bio below. 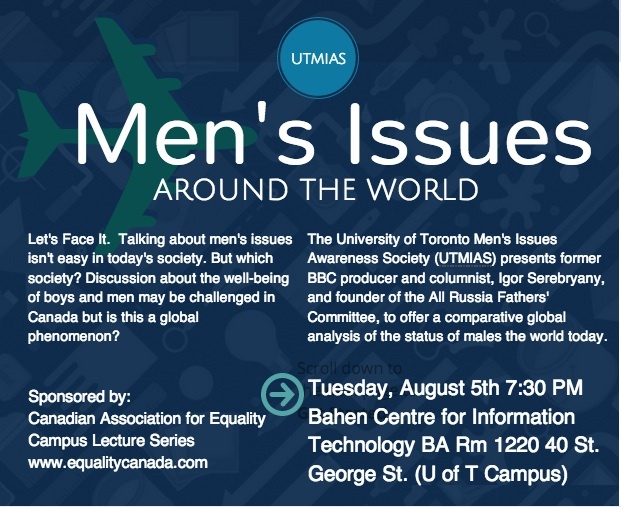 He’ll compare the issues faced by boys and men in Russia with those we experience in Canada and offer a comparative global analysis of the status of males in various parts of the world. Igor is in Canada for a brief stay so don’t miss this unique opportunity to hear an international perspective on issues that matter to us. Born in 1965 in Moscow, Russia (then Soviet Union). Graduated Moscow State University, major – journalism, in 1987; U.S. National Democratic Institute for International Affairs (Washington, DC), major – public relations, in 1997. I’ve been working in various Russian, British, Canadian, Chinese mass media since 1987 to date. In 1993-1997, I was a member of Moscow Provincial Parliament. I moved to Canada permanently in 2002, but had to come back to Moscow in 2008, after my newborn son was abducted by his Russian mother. (This is why and when my struggle started).